Internal Correspondence, May, 1994. "The Crow Takes Flight At Capital Retailer Conference". 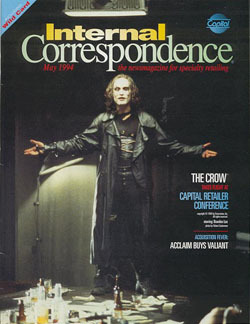 This distributor magazine features an article on the premiere of The Crow movie at Capital's retailer conference that year. It also discusses the Crow comic and how the whole franchise pushed forward despite the untimely death of Brandon Lee.